The Verdugo picnic cooler tote is a fully-insulated picnic cooler tote with service for four. 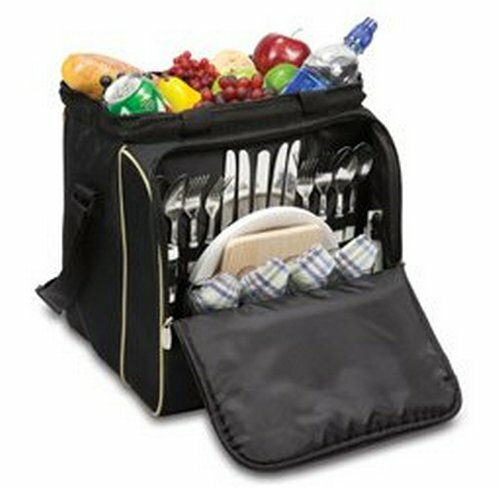 It features: durable 600D polyester canvas construction, an adjustable shoulder strap, and a fully-insulated food/drink compartment with 30-can capacity. The Verdugo includes: 4 plates (PS, 9"), 4 stainless steel forks, knives, and spoons, 4 tumblers (plastic, 10 oz. ), 4 napkins (poly/cotton, 14? x 14? ), 1 stainless steel, waiter-style corkscrew, 1 hardwood cutting board, 5.5? x 5.5? x 0.5?, 1 stainless steel cheese knife, and 1 set of salt and pepper shakers. The Verdugo makes packing your picnic a whole lot easier and a lot more fun!